Eeeps, I have concerning news to report for those who are as enchanted by tvN rom-com drama Why Secretary Kim as I am. The drama has apparently switched screenwriters! WTF you may be screaming, but the switch actually happened after episode 2, with original screenwriter Jung Eun Young who did Boarding House No. 24 joined by two new screenwriters Baek Sun Woo and Choi Bo Rin who worked with the Secretary Kim PD before in one of the seasons of Rude Miss Young Ae. 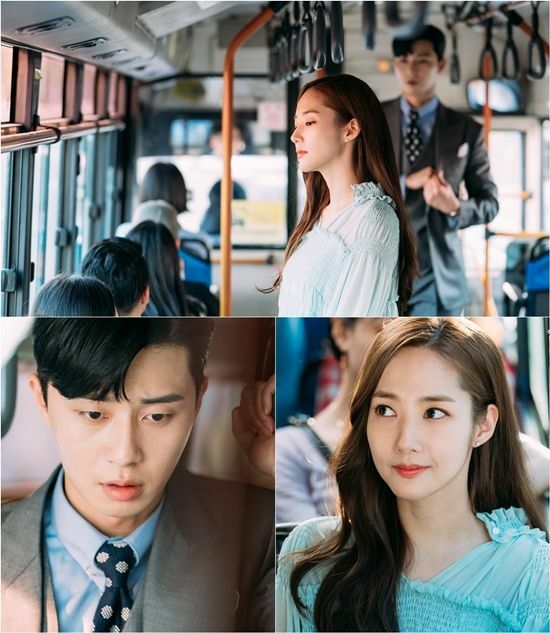 The three writers collectively wrote episodes 3 and 4, and starting with episode 5 the original writer Jung Eun Young is gone and the two new writers will jointly write the remainder of the drama. I don’t have any info on why there has been a writer change but remain hopeful that the drama will continue without hiccups in growing the romance between Young Joon and Mi Soo since I continued to enjoy episodes 3-5. Ack! This could be either good or bad. I really hope the writer decides to keep most, if not all, of the skinship that happens in manhwa. They’ve followed the webtoon pretty well, except for the last scene in Episode 6 which played out a little differently than expected. I want the heart-thumping kisses and romance to stay the same! Even though, this is Korea we’re talking about, I want tvN to be more mature than the public TV channels. I think TVN in general is not too heavy on censorship compared to the public channels.For example, in the current airing lawless lawyer or in the past (chicago typewriter Hwayugi, live up to your name)just to mention a few all had intense kissing scenes.LL even had a bed scene(or shot coz nothing really happen lol ) in one of the episodes(sorry if im spoiling for those who havent watched yet).Nothing vulgar but you get the point, moderate skinship and romance in TVN dramas are not heavily censored.OCN and JtBC are flexible with this too.I think if they are reluctant in this drama or tame it down.it will be because of the actors are not comfortable doing too much not because of censorship. tvN might be taming things down but I’m not sure about that the WWSK leads are the reason. Park Min Young had, or the implication of, bed scenes in both Healer and Seven Day Queen. In Sungkyungkwan Scandal, the final scene is the OTP preparing to have some adult times. 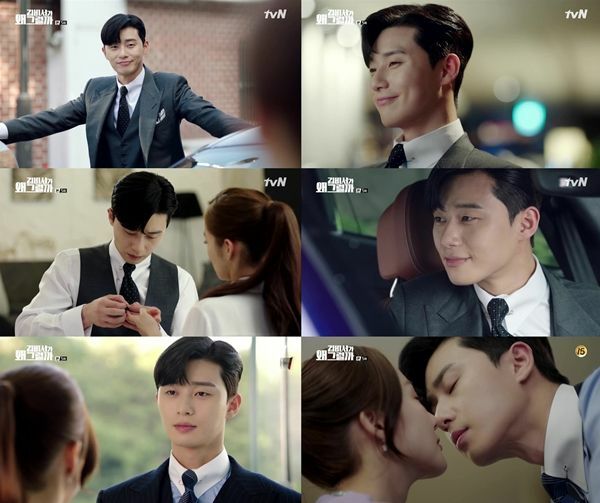 Park Seo Joon had a scene(s) in Fight My Way and Witch’s Romance. Not sure about Hwarang because I haven’t seen it. Both these actors are familiar with romantic scenes but I think it’s not time yet for WWSK. The couple hasn’t even officially started dating, or for that matter, confessed their feelings yet. Having them kissing or sleeping together is it a bit premature at episode 7.
ep 6 has hit 7.7% in ratings so it could mean the newbies are doing something right.There must be a reason why they switched. By the way, Jo Jung Suk and Gummy are getting married this coming fall!!!!!!! !Another oppa and ballad queen off the market. The almost hug and almost kiss, pout routine … is getting a little tired by Ep 6. Just me perhaps, I wasn’t as thrilled with Eps 5 and 6. I still liked the episodes, but I do want to see a bit more momentum in whatever plot there is going to be. yes the ending of Ep 6 is a little blah… Hope Ep 7 will pick up the pace again, don’t want to see it go draggy and wishy washy. As long as it doesn’t turn into a Cheese In The Trap its all good. That drama has put a fear of webtoon adaptations into my mind. Don’t forget who your male lead is show! No wonder, despite not liking directorial style and acting, i actually quite enjoy the writing. Now, start from episode 3, it’s lost all the elememt what make it work for me. For me with episode 6 it lost its drive. I know it is based on a comic but even then I disliked the brother storyline. It was so boring und totally weird how the kidnapping was settled. The brother in the Drama is even more weird. The actor unfortunately is only okay. This might be the reason why I started lost interest after episode 3. I couldn’t pin point what, but it just felt different. MTE. No wonder i felt like something was missing since ep 3. The first two episodes were quite solid…not so much from there on. I was suspecting that was happening. As the pace, feel and vibe of the drama did change rather suddenly. I hope the decision will not be one they regret.